The NordicBet Poker download is everything a player wants it to be: quick, safe, and secure. NordicBet is one of the premiere rooms on the Microgaming Network and thanks to our exclusive €2000 bonus, it’s a room you can’t afford to pass up. Mac and Linux users can choose the play in browser option as there is no compatible download version. This Instant Play version is fantastic and boasts all the features included in the Windows download. For PC users, the install file is just under 500kb, and you will need about 25MB of space to install it on your computer. The Nordic Bet Poker Download is only available in English. After installation you will be greeted with the Nordic Bet Poker Lobby where you can create an account. Registering your information is very easy and doesn’t take much time. Once your signed-up and logged in you can navigate between Cash Games, Sit and Gos, and Tournaments using the tabs at the top of the lobby. Further filter options, such as the ability to sort by stakes or game, are available right below the tabs. In short, finding your favorite game is quite intuitive. 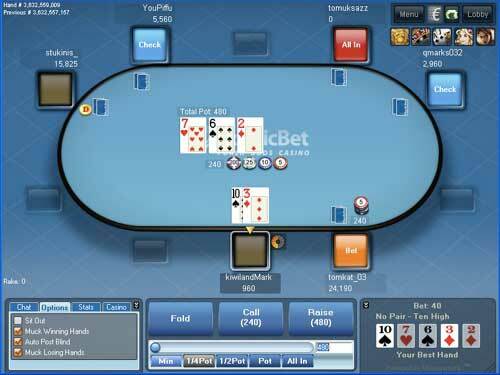 Currently, Nordic Bet Poker offers Texas Hold ‘Em, Omaha, 5 Card Stud, 5 Card Draw, Razz, Omaha, Omaha Hi-Lo, and 7 Card Stud. Once you take your seat, the Microgaming software really shines. You are welcome to customize the size of your tables and set various personal preferences, like a 4 color deck, to customize your poker experience. In addition to being stable, the dealing is done very quick, ensuring you get a ton of hands in. Visually, we have seen better. The room isn’t exactly aesthetically pleasing but it could be worse. It’s solid, but not up to par with the likes of PokerStars or even Full Tilt Poker. Overall, the Nordic Bet Poker Download is very impressive. It’s a grinders dream — very stable and fast. If you’re looking to play at Microgaming, look no further than Nordic Bet Poker.